Around 1970 PolyProcessing Company helped pioneer the rotational molding of large plastic parts. At the time, their core business was retailing fluid fertilizers for row crops in Louisiana. High density crosslinked polyethylene (HDXLPE) tanks provided an economic alternative to both fiberglass and stainless steel for corrosive applications in fertilizers. The durability and impact resistance of polyethylene afforded additional value for mobile, field tank applications in agriculture. 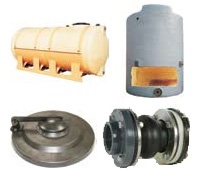 Later, the company expanded their rotational molding business to include industrial tank applications. Today, PolyProcessing provides polyethylene tank storage for the water treatment and chemical processing markets with a core product offering of large, crosslinkedpolyethylene storage tanks.